How do you treat sore muscles after a workout? After doing a strenuous physical activity, it is normal to feel sore one or two days after, especially if you did something that your body is not used to doing. This is referred to as DOMS which stands for Delayed Onset of Muscle Soreness. DOMS occur 24 to 48 hours after your workout. Your muscle fibers get stressed during your workout and small microscopic tears occur in muscle fibers which results in Delayed Onset of Muscle Soreness. The mild muscle strain injury creates microscopic damage to the muscle fibers. Scientists say that this damage plus the inflammation that comes with these tears, causes the pain. Take note that these microscopic tears does not mean that you should stop exercising. On the other hand, getting DOMS is also not an indication that your workout was effective. You don’t have to feel soreness or pain every time you finish exercising for you to say that they worked. Why do I feel sore after I work out? No one is exempt from getting sore after a workout. Beginner exercisers and elite athletes experience DOMS alike. This muscle soreness is simply a symptom of using your muscles and placing stresses on them that are leading to adaptations to make them stronger and better able to perform the task the next time. If you are a new exerciser, don’t worry if you feel sore after a workout. It is normal especially if your body is not familiar with the exercise, and it will go away in a day or two. How do I prevent muscle soreness? How do I treat DOMS? The exact reason why and how DOMS occur is not yet known. Several treatments such as ice, rest, massage, heat, and stretching have all been reported as helpful in the process of muscle recovery. A significant amount of Flexibility is important even to non-athletes. Stretching should always be included in a training program. This will keep the muscles from tightening and muscle spasms. Stretching is not only beneficial to treat Delayed Onset of Muscle Soreness but more importantly to improve flexibility. Click here to read more about STRETCHING. Take a day or two of Rest while your body recovers from DOMS. If you want to keep exercising, try a different activity or do a lighter intensity. Most importantly, always do a proper Cool-down after your work out. This will ensure circulation to flush out the waste products in your muscles after your exercise. Research found that applying Heat to treat muscle soreness helps alleviate muscle soreness. The increase in muscle temperature allows more blood flow to the worked out muscles which brings fresh oxygen and nutrients. Applied heat to your sore muscles also helps get rid of chemical irritants that trigger pain. What should I do if I want to work out and I’m still sore? You can still continue to train even when you feel sore, but don’t expect to set personal records or optimal performance. Delayed Onset of Muscle Soreness affects only the muscle groups that you previously worked, so you can work out other muscle groups while the fatigue parts recover. Simply put, take it easy when you’re feeling sore. Following a well-planned Training Program is helpful to maximize your workouts, especially on sore days. Having a good exercise program will ensure that you can keep up with your training without further muscle damage and minimize injury. Read more about DOMS here. Delayed Onset of Muscle Soreness or DOMS occurs naturally and can be felt by anyone, especially if you do something that your body is not familiar with (ie. Progression in your training program, doing a new physical activity or sport). Make sure that you warm-up before you workout and do a proper cool-down after to ensure blood flow to your muscles. Delayed Onset of Muscle Soreness goes away in one or two days but you can do some treatments to alleviate the soreness. Stretch the sore muscle or apply heat on it after you work out. You can still work out even while experiencing DOMS. Work on a different muscle group or cross-train. Be able to differentiate pain from muscle soreness and pain from an injury. DOMS usually goes away after a day or two. Also, the soreness from DOMS should not limit you from doing light to moderate activities. Seek medical attention if you feel stinging or persistent pain. Follow a well-planned Training Program to ensure progress in your workouts while allowing enough recovery for your muscles. This will ensure that you maximize gains and minimize over-training and injury. I can help you get the best out of your workouts from a Periodized Training Program. For more information or if you would like to contact me, check out my SERVICES page and answer the short form so I could know you a little better. Click HERE to continue to the services page. I guarantee results, if you guarantee adherence. Having a well-programmed training plan and taking some precautions can greatly minimize risks to these injuries and ailments. Here are some tips to prevent running injuries. – Don’t Ignore Pain: From my experience as a sports therapist, most runners (and other athletes) who come to the sports clinic and complain with unbearable pain are usually those who have been ignoring the pain and discomfort for some time and waited for the pain to worsen before going to be checked and treated. Muscle soreness is natural and it is sometimes okay to ‘run through the pain‘ especially if you only feel slight soreness from your legs, but if the pain has been consistent and increasing, then it’s a sign that what you are feeling is more than just regular DOMS. If you run with sore legs, it might also mean that other muscles will be compensating for the effort. So if you feel sore but you need to add mileage, run at a slower pace. Read about the difference between “Chronic” and “Acute” Injury here. – Rest Adequately: Most of these running injuries result from lack of enough recovery time for the body to repair and strengthen itself for your next run. At the slight feeling of unusual discomfort or pain, lessen your running load or activity and rest adequately. – Warm up and Stretch: Tightness of muscles causes an imbalance in your body. Make sure that you stretch especially after you run, holding the stretch for each area for at least 20 seconds. Before you run, warm-up properly and try to do dynamic stretching and reach the muscles ROM to ensure that they are ready. Some people and websites advice focusing the stretch for the calves, hamstring, groin and quadriceps, but a whole body stretching routine which includes other body parts that are involved with running (shins, hips, low back, abdominals, and even chest and shoulders) will ensure that your body is well-balanced and ready for your run. A good warm-up routine lasts for 5 to 10 minutes and conditions the whole body, not just the legs. – Lift those weights: Resistance or strength training can help you develop muscle strength and endurance for your runs. Resistance training also adds to your core strength. Don’t worry about bulking up from weight training – having a balanced training program will ensure that you reach your goals without adding extra weight. – Cross train: Doing other activities or sports will develop your body in different aspects and may help you improve your agility, stamina, and coordination. This helps prevent injuries because your body becomes prepared to react to different kinds of stresses. Don’t just run – try swimming, biking, basketball, football, even wall climbing! Cross-training also minimizes risk for overuse injuries which occurs especially when you repeat the same activity (i.e., running) over and over again. – Dress appropriately: Make sure that your shoes fit right. If you have flat feet or high arc, wear appropriate shoes that meets your specific needs. Check the soles of your running shoes – running shoes are usually good after 400 to 500 kilometers. If possible, wear a separate pair for every day walking and running to prevent your shoes from wearing out quickly. – Patience is a virtue: Don’t force yourself to run longer distances too soon. A safe range for increasing distance is 10% per week. Do not try to run uphill or downhill if your body is not ready for it. It is commonly thought that running downhill is easier because you get gravity to lessen your effort, but running downhill can actually be more stressful to your joints and muscles as the body tries to ‘brake’ and control the fall. – Stay hydrated: Long duration physical activities like running may require additional 1 1/2 to 2 /12 cups of water on running days. drink 150 to 250ml of water 15 to 30 minutes prior to your run. Try to drink at least 150ml of water after every 15 minutes during your run. Hydrate with a sports drink after your long run to replenish lost liquids and electrolytes. – Talk to a coach or trainer: If you are serious about wanting to improve your performance and adding up to your mileage, talking to a professional is the best thing to do. Reading about training programs and running regimens may not be enough. Doing what other seasoned runners in your club may not even be beneficial. Individualization of your running program is very important not only because it will significantly improve your performance, but it will also decrease risks for injuries. Check out running shoes and other gears from Amazon. Have you experienced any running injuries? How did you recover? What else do you want to know about running injuries and ailments? Let me know in the comments? Here’s an infographic by Greatist that shows How to Foam Roll Like a Pro! Read easy and effective ways to use your foam roller for muscle pain treatment, recovery, and improve your performance! Myofascial release is a soft-tissue therapy technique to treat skeletal muscle tightness and pain. It aims to relax stiff muscles, improve blood circulation, and improve flexibility in muscles. I practiced as a myotherapist for four years before and I witnessed how this massage technique work wonders! I have done myotherapy for different kinds of pain-struck people: from competitive athletes to sedentary office workers who have been complaining of chronic pain and aches. I have had other therapists do myofascial release to me, and have done myofascial release to myself and as both a provider and recipient of this luxurious healing procedure, I can attest to its effectiveness. Of course, nothing beats a soothing massage done by expert massage therapists while you lay down and relax, but when you’re in a race or competition and you need release from tensed up muscles this luxury is not an option and you need an alternative to take your aches away. As I’ve mentioned earlier, I have done myofascial release to myself many times and you can do it, too, but it takes trained hands to find, press, and release those stubborn muscle knots and tight muscle bands. Fortunately, someone invented the Foam Roller which is now a very common partner of many runners, marathoners, triathletes, swimmers, and other athletes. Using the foam roller is very easy and it can be done by almost anyone who needs relief before or after a race. Foam rolling is a technique that has been developed as a treatment in physiotherapy to inhibit over-active and tight muscles. Apart from targeting tight muscles, foam rollers can also be used as a challenging exercise tool to correct posture, improve balance and coordination, and work the core. Pilates exercises use the foam roller in various ways to work the whole body and challenge the core. Read: What is a Foam Roller? Foam Rollers can also be used to work not just stubbornly tight muscles, but also to strengthen your core! In the absence of a massage therapist or athletic trainer, using foam rollers for myofascial release can be effective for many major muscle groups including the gastrocnemius, latissimus dorsi, piriformis, adductors and abductors, quadriceps, hamstrings, hip flexors, and the thoracic spine. Usually, the foam roller is placed under each muscle group and pressure is applied on the trigger point by putting your body weight on the foam roller. In actual massage therapy, the pressure is held for 7 to 20 seconds, depending on the tenderness of the area, amount of pressure administered, and tightness of the muscle knot. Techniques vary in massage therapy but since only a limited amount of pressure can be applied in foam rolling, it is recommended to ‘roll’ on each area or hold the pressure for 30 seconds up to 1 minute. The GRID foam rollers have firmer surface and features unique “distrodensity zones” of varying width that allows for precision massage so you can target those muscle knots more efficiently. If you want to improve your performance and maximize your training, then add a foam roller to your training program both for challenging core exercises and relaxing muscle release! Use your foam roller on an exercise mat so that it won’t slip or roll easily and you have maximum control. A tip from a former myotherapist: the area where your pain is may be different from where your problem is. The nerves in our muscles can sometimes produce a ‘radiating pain’ which means that the tight knot exhbits pain somewhere else. Most people use the foam roller to press and roll only on the areas where they feel the pain. A common example is using the foam roller on tight IT bands for ITB pain and knee pains. The pain you feel on your ITB or knee is only the symptom of tight muscles somewhere else and rolling on your ITB erroneously would not relieve you of anything and may even cause tenderness on your ITB. Use the foam roller with caution and precision. Don’t depend on your foam roller to relieve you of your pain. Warm up properly before you work out, make sure you cool down enough after you train and stretch regularly. Apply heat packs or warm pads to painful areas to relax the muscle before you use the foam roller. Not all pain can be treated using foam rollers especially acute ones. Do not use the foam roller for ankle sprain, muscle strains, and bruises. Do not use a foam roller on a joint. They are supposed to work your muscles only. Muscle pulls can occur to your hamstrings (back of thigh), quadriceps (front of thigh), gastrocnemius (calves), or adductors (groin muscle/inside of thighs). A muscle pull is a small tear on a muscle that is caused by overstretching. Pulling a muscle sometimes produces a popping sensation when the muscle tears. It is an acute injury that can be very painful upon onset. How to treat muscle pulls: Like any other acute injury, stop from your activity and rest. Immediately put ice on the muscle for 10 to 20 minutes, until the swelling has lessened. Seek medical attention to determine how much your muscle is damaged. For muscle pulls, you need to undergo physiotherapy treatments so that your muscles will heal properly. If you just let the injury pass, the fibers in your muscles will develop scar tissues which may hinder movement or increase risk for future injuries. How to prevent muscle pulls: Muscle pulls happen on shocked muscles either because they are not properly warmed up or because you made your muscles do something heavy that they have not done before, or both. Make sure that your body especially your legs are warmed up properly before you run. Warm up for 5 to 10 minutes, doing both metabolic movements to facilitate blood flow to working muscles and dynamic stretching. Patellofemoral Pain Syndrome or PFPS is obviously a common injury to runners that its layman’s term is called “runner’s knee.” However, this may happen to other athletes as well. 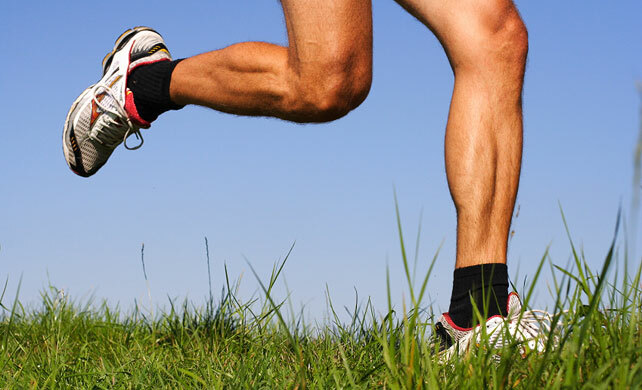 Runners knee occurs when the kneecap is out of alignment and stress is continuously placed on this misaligned joint. It is a chronic injury that results from wearing down of knee cartilage. Runners knee or PFPS can be recognized with pain around the kneecap when going up or down stairs, squatting, or sitting with knee bent for a long time. Some people may be more susceptible tight to this injury because of their anatomical structure (flat feet or misaligned knees turning inward), but tight and under-developed hamstrings and quadriceps are usually the main culprits. How to treat Runners Knee or PFPS: Runners knee is an injury that will heal given its own time. But this doesn’t mean that you can run it off. Take an appropriate time to rest and avoid putting weight on your knees. While resting, you can do cross-training such as cycling or swimming to relieve your knees of the stressful loads of running and strengthen the muscles around them. Put ice around the area of your knee if you experience swelling, for 10 to 20 minutes every other day or until the swelling is gone. How to prevent Runners Knee or PFPS: Your knees will thank you for doing resistance exercises. Do other activities apart from running like Pilates. Have your feet and knees checked – wear orthotics for your feet if you are flat footed. You can also wear a fitting knee support if pain comes back after treatment. Be strict about increasing your mileage to 10% per week. Run on level roads and limit your downhill or uphill runs. Read about “How to Stretch” here. The Iliotibial Band or ITB Syndrome causes pain felt on the outside of the knee. The Iliotibial band (ITB) is a long tendon that connects the top of the hip to the knee at the side of the thigh. It is commonly believed that ITB syndrome occurs when the ITB tightens and rubs against the knee cap. However, new studies suggest that Iliotibial band pain can be caused by tightness from hip muscles pulling the knee. This syndrome can be mistaken for knee pain since pain is felt almost on the same area. You can determine if you have Iliotibial band syndrome by bending your knee to a 45 degree angle and you feel pain on the outside of your knee. Getting an MRI may be the most accurate way to know if you have ITBS since it will show any thickening of the band. How to treat Iliotibial Band Syndrome: The best way to treat this syndrome is to decrease your mileage or not run at all. Rest is very important to lessen the load on your knees and give time for them to heal. Get a massage to loosen up the muscles around the hips and thighs. Stretch your hips and thighs regularly. Foam rollers are starting to be popular, but you need to know how to use them properly to gain the most benefits. How to prevent Iliotibial Band Syndrome: Warm-up properly for 5 to 10 minutes before you run, ensuring that your leg muscles are ready for the run. When you start to feel pain around the knee while running, slow down and refrain from running uphill or downhill. Decrease your mileage for the week or cross-train. Make sure that your shoes are not worn out on the sides of the sole and replace your shoes as soon as you can if they are worn out. Another thing you can do if you regularly run on a track is to change the direction of your run. Have you experienced any of these conditions before? How did you recover? Running Injuries happen when you push yourself too hard too soon. Your body should have enough time to recover and adapt to training stress. Most runners want to run through the pain which often leads to worse injuries. It is important to be familiar with these running injuries and ailments and know how to prevent them. In this three-part series, I will go through the common running injuries and ailments and show some ways how to treat and prevent those conditions. Plantar Fascitis is a chronic injury to the plantar aspect or the bottom part of the foot. Plantar fascitis occurs when the tendon or the thick band of tissue that connects the heel to the toes gets inflamed. Plantar fascitis is usually caused by tight calf muscles pulling on the heel when running. Also, people with a high arc on their feet are more susceptible to this injury. Although Plantar fascitis is related to stress in the plantar fascia, it can sometimes happen without obvious reasons. How to treat Plantar Fascitis: When you start feeling pain on your plantar fascia, stop your activity and try to stretch your foot and calf. After your run, you can do trigger point release on your foot by rolling a tennis ball under your foot. Get a foot massage. Rest for at least 48 hours and progressively increase your distance when you run. How to prevent Plantar Fascitis: Regularly stretch your feet and calves. Make sure that your shoes fit right and are still in good condition. If you have a high arc, wear insoles or arc support. Try to refrain from running uphill. Achilles Tendinitis is an inflammation of the Achilles tendon or the tissue that connects the back of your heel to your calf muscle. Achilles Tendinitis produces a burning sensation on the area especially in the morning and with activity. It is usually caused by repetitive stress to the Achilles tendon when you add distance to your runs. Tightness from the calf muscles is also a common culprit to this injury. How to treat Achilles Tendinitis: Treatment for any running related inflammation is Rest for at least 48 hours and gradual return to running. Upon onset of Achilles tendinitis, you can put ice on your heel or directly on your Achilles tendon for 20 minutes. While recovering from injury, you can regularly put heat on the area for 20 minutes and stretch it. Massage will also help. How to prevent Achilles Tendinitis: Regularly stretch your calves before and after your runs, and during rest days. Make sure that you are warmed up properly before you run. Ankle sprain is a very common acute injury caused by accidentally turning the foot at the ankle joint sideways. The tendon and ligaments of the ankle are overstretched and even torn when the foot twists inwardly. How to treat Ankle Sprain: Never run through ankle sprains. If you do, more ligaments will get damaged and just worsen the injury. Upon onset of ankle sprain, stop your activity and rest your foot. Put ice on the inflamed area for 20 minutes. Apply elastic bandage around your ankle and foot for compression and help lessen the swelling. Elevate your foot to let the blood flow away from the swollen area. Do not massage sprained ankles. Ankle sprains take up from 3 days to 2 weeks of rest for full recovery depending on the severity of the injury. How to prevent Ankle Sprains: Do exercises that strengthen your foot and leg muscles. Be aware of your surroundings when you run and try not to run long and fast distances on unfamiliar routes, especially trail roads. If you have a race, go through the race route at least once so that you are familiar with the terrain. Stress fracture is also a chronic injury that can cause extreme discomfort and pain. Stress fracture is a small crack in the leg bone or foot which occurs when the body works too hard without having enough time for the tissues and bones to repair and recover. It is a chronic injury that may start with minimal pain but gets worse and worse with activity. How to treat Stress fracture: Rest as soon as you feel extreme pain and discomfort in your legs. Do not run through the pain as the pounding movement from running adds to the injury. Seek help from a medical professional. How to prevent Stress Fracture: Simply following a well-timed training program will prevent you from developing stress fractures. Make sure that you have enough rest and recovery periods in between training bouts. You can also switch running surfaces once in a while; for example, run on the road today then run on dirt or grass the next day for a softer surface. Shin splint is another common running injury that can be felt in the front or inside of the leg along the shin bone (tibia). Shin splints occur when you suddenly run longer distances or when you increase the number of days you run in a week too quickly. Note that people with flat feet are more susceptible to develop shin splints. How to treat Shin Splints: Rest for at least 48 hours, or until symptoms are absent. Stretch your tibialis anterior and massage the area. Gradually return to activity. How to prevent Shin Splints: Make sure that you are warmed up properly before you run. Most runners usually stretch the back of the legs, the calves, but neglect the muscles at the front of the legs, the tibialis anterior. Include this muscle in your stretching routine. Make sure that your shoes fit well. Include strengthening exercises in your training program like toe-up walks, backpedals, and foot mobilization exercises. These are the first five injuries for this series. Next on the list will be Muscle strain, Runner’s knee, IT Band Syndrome, Piriformis Syndrome and Low back pain which I will post next week! The 3rd and last part will be some other ailments and additional tips to prevent running injuries. In a previous post, I stated the benefits of stretching and a couple of different kinds of stretching. A helpful video was also included. But do you know that like any part of your training, Stretching or Flexibility training should also follow the FITT principle? 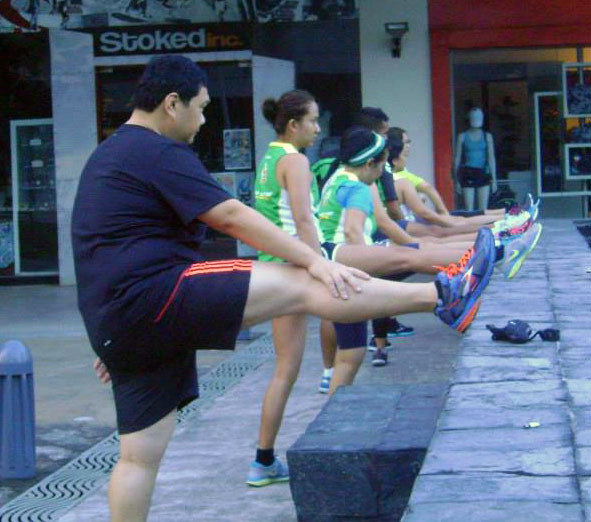 Frequency – Ideally, stretching should be done everyday to maximize the benefits and improve overall flexibility. However, this does not always happen especially for busy individuals like you and me. At least include a sensible stretching routine after every workout that you do. Intensity – A good stretch should feel good. Joints should never be stretched beyond their Range of Motion (ROM) that it becomes painful. The focus of the stretch should be to bring the joint just to a point of slight tension. Time – As a standard for static stretching, holding a stretch for 30 seconds produces beneficial results. If you are doing a passive stretch (assisted by your personal trainer or someone else) this would be easy to do. You might need more motivation to hold the stretch for every joint for at least 30 seconds if you are stretching on your own. Stretching is usually the part of the workout that gets cut short when time is running out. A good workout design would ensure that this essential part of the training would not be left out. Type – Mainly, you can do either Dynamic or Static stretching in your workouts. There are other kinds of ‘advanced’ stretches that you can do depending on your need, like the PNF (Proprioceptive Neuromuscular Facilitation) Stretch, AIS (Active Isometric Stretch), etc. Stretching can also be done using other equipment such as elastic bands, yoga straps, foam roller, and even your towel. Work within your limits. Do not try to overstretch your joints and muscles. 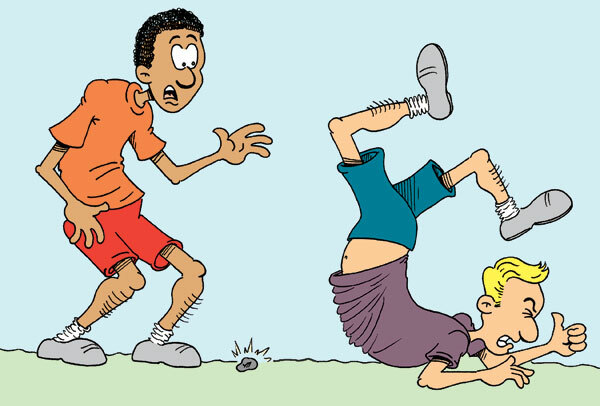 If you are in a group exercise class such as yoga or pilates, don’t be intimidated by those who can touch their nose to their knees (it sometimes looks weird anyway). Remember that the stretch should feel good. Incorporate breathing to your stretching routine. This works well especially when you’re doing the static stretching as cool down. Do long breaths, exhaling upon relaxation and then slowly inch your way to a greater ROM. Do static stretching only after your muscles are warm. Muscles lengthen more easily when they are warmed up. Try other kinds of stretching activities such as Pilates, yoga, and breathing classes to make your stretching more fun and interesting.